Once resources have been defined for the project, the next step is to assign them to specific activities. Each resource assignment approach requires the activity to be selected and the planned units and distribution for the activity to be entered. There are two ways to assign resources. The first method described is best for assigning multiple resources to a single activity. The second method is best for assigning a single resource to multiple activities. Double-click on the activity or right-click on the activity and select Properties. Click the Assign button next to Resources. Click the checkbox next to the desired resource. Click in the Distribution column to change to per Duration; otherwise, leave as per Day. Click in the Planned Units column and enter the amount of resource required. NOTE: If the Planned Units column is left blank, no assignment will take place. Assign Controls whether or not the resource is assigned. Description The text field for describing the resource. Category The type of resource. Distribution How the resource is used by the activity. Options include per time period (e.g. per Day if the schedule is in days) or per the entire activity duration (i.e. Per Duration). If a resource is assigned per period, the rate of consumption will remain fixed while the total amount will fluctuate with the activity duration. For example, if activity A has been assigned 10 carpenters per day with a duration of 10 days, then activity A will require 100 carpenter-days. If the duration is reduced to 5 days, activity A will still require 10 carpenters per day but the total amount will be reduced to 50 carpenter-days. If a resource is assigned per duration, the total amount will remain fixed while the rate of consumption will fluctuate with the activity duration. For example, if activity B has been assigned 10 carpenters per duration with a duration of 10 days, then activity B will require 1 carpenter per Day. If the duration is reduced to 5 days, activity B will still require 10 carpenter-days total but the rate of consumption will increase to 2 carpenters per day. NOTE: If any resources have been assigned per period and the schedule time unit is changed, they may not properly convert. For example, 48 widgets per DAY would become 48 widgets per HOUR instead of 2 widgets per HOUR. Planned Units The amount of the resource required. Resources may be assigned using up to 5 decimals. 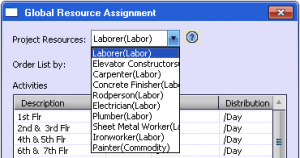 Note, however, that they will be rounded to the nearest 100th in Excel and for display purposes only, to the nearest 10th place in the Global Resource Assignment window..
To assign a resource, one at a time, to multiple activities, click Tools > Assign Resources… in the resource section of the dropdown menu. The Global Resource Assignment window opens. Every activity in the schedule will be listed in the box. (If any objects are selected on the canvas, only those will be listed in the box). Activities may be ordered by description, ID, start date, finish date, or grid number by selecting from the Order List Bydropdown button. The first column lists the description of the activities. The second column lists the activity ID. The third column lists the rate. The fourth column lists the distribution. At the top is a dropdown button containing all the resources in the project. To populate the rate and distribution columns, click the down arrow button and select the desired resource. The rate and distribution columns will populate according to the resource selected. Only one resource may be viewed at a time. To modify resource assignments, click on the row of the desired activity to enable the rate and distribution columns. Enter the amount or number of the resource required in the rate column. In the distribution column, choose from the dropdown button. When finished, click the Exit icon . NOTE: If the rate column is left blank, no assignment will take place.